Every so often a film tries to be two or more things that seem incompatible. In some cases, this succeeds – but most of the time, it fails, and fails hard. “World War Z” is in the latter category: it’s too tame to be a good zombie movie but too scary to be a good international thriller. As we follow Gerry Lane (Brad Pitt) around the world trying to find the source of a zombie virus outbreak, there are plenty of individual scenes that work, but the film as a whole just doesn’t gel. The first act of the film works well enough: we follow Gerry, his wife Karin (Mirelle Enos), and their two children through a normal morning, with the news playing in the background occasionally containing ominous references. Their commute to take the girls to school is interrupted by first bad traffic and then explosions and people fleeing a mob of, well, zombies. The family bolts, trying to make it to a place where Gerry’s former coworkers at the United Nations can airlift them to safety. Gerry, we learn, used to be an investigator for the UN but quit to save his sanity and spend more time with his kids. His old boss Thierry Umutoni (Fana Mokoena) more or less blackmails him into returning to his old job and helping a scientist track the source of the zombie plague. So off Gerry goes, travelling to Hong Kong, Jerusalem, and other exotic locales where we get to meet exotic people and see them turned into zombies. In Jerusalem he picks up one of the few awesome characters in the film, a young Israeli soldier named Segen (Daniela Kertesz). She doesn’t say much, but is exactly the sort of zombie-capping shot of action hero the movie needs. Unfortunately, she doesn’t get to do much – but what little we do get to see is very cool. The further the film goes, the weaker it gets – the explanation of how the zombie virus spread (people travelling on airplanes) only makes sense until you realize its incubation period is under 15 seconds and its infection rate is 100%. A plane full of zombies is not going to touch down normally and let its passengers off to spread the virus the way one full of flu virus carriers would during a flu pandemic. In fact, as we see in the film, planes full of zombies tend to crash in the middle of nowhere. Worse, the film has an unsatisfying anti-climax of an ending. Without giving too much away for those still determined to see it: it’s very strange to watch a complete non-event treated cinematically as a huge, amazing thing. While it’s clear what the filmmakers were going for, it winds up just being strange and awkward. Pitt is a top-notch actor who has finally aged out of his improbable handsomeness into something approaching believability, and he has good chemistry with Enos and Keretesz. It’s a pity that the film just doesn’t come together. Word has it that the entire third act was scrapped and heavily reshot and re-edited, which probably explains a lot of the film’s weaknesses. But really, the biggest one is right there on the posters: you can’t have a PG-13 zombie movie. You just can’t. 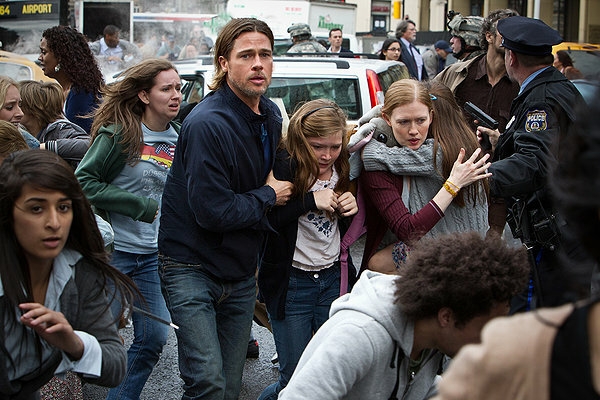 If you’re a big enough fan of Pitt, the other actors, or zombies, “World War Z” is probably worth seeing, but otherwise, it’s probably best to give it a miss.